We are pleased to present newcomers Area 51, a duo from outside Santiago de Chile Rodrigo Valdivia and Camilo Gil with their ‘Berlink’ EP featuring Tea Time including a remix by Alexi Delano. While they are certainly not newcomers to the stage having shared the DJ booth with legends Juan Atkins, Kevin Saunderson, Derrick May, Dandy Jack, Luciano, Carl Craig and many more.... As producers their inspirations are broad drawing from Detroit, Frankfurt and South America however ‘Berlink’ will be their debut EP featuring vocals of legendary vocalist Camilo Castaldi more commonly known as Tea Time. Camilo is the frontman in the Chilean Funk group Los Tetas and his multilinguistic rap chants helped propel Los Tetas to a nomination for MTV’s ‘Best New Artist in Video’ in 1996. Tea Time has spent much of the last two decades working individually and collaborating with other artists like Ricardo Villalobos, Gemini and others. 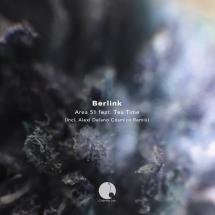 Berlink by Area 51 feat. Tea Time was composed by four artists all emanating from Chile but this track draws from significant German inspiration. Berlink is comprised of the prototypical minimal tech house percussions, claps and loops, layered with rhythmic guitar strums, filtered hi-hats and Tea Time's truly unique multilingual rap/chants panned across both channels. Alexi Delano's Cósmico Remix have been handled by Chilean born underground stalwart Alexi Delano. Raised in Sweden Alexi founded strong ties to Swedes such as Adam Beyer, Cari Lekebusch & Jesper Dahlback and began pumping out releases on well known labels such as Drumcode, Plus 8, Minus, Visonquest, Get Physical and many more. Alexi has always been known for his heavily compressed sound straddling the realms of shiny minimalism and dark vivacious techno. The aptly titled cosmically inspired remix comprised of pads played in an unusual pitter-patter rhythm, haunting chimes and Tea Time's psychedelic vocals warped with delays on top of a chunky rhythm. An unusual 30 second vocal breakdown can help a risk-taking DJ help send his/her set in a trippier direction just before the rhythmic percussion kicks back in.